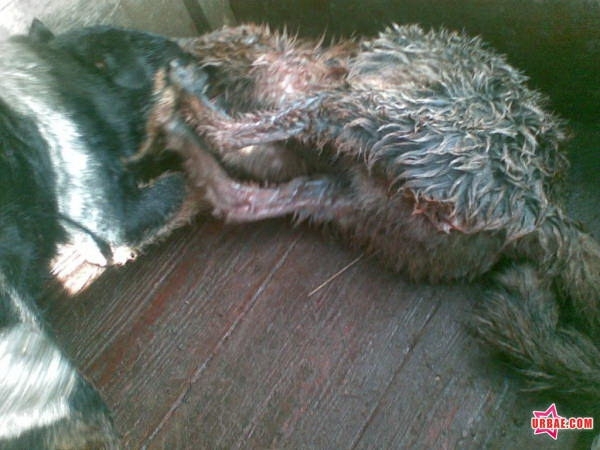 Serbia: Temerin City, Their Animal ‘Shelter’, Death After 3 Days and a (National) Public Attorney Who Says All Is Ok ! In the city of Temerin, which is located near to the city of Novi Sad, a firm named ‘JKP Temerin’ operates as the garbage collection company. In Temerin is a ‘dog and cat shelter’, given a permit for use by the Direcctor of Veterinary department of Serbia, Mr Micovic. After three days at the ‘shelter’, dogs are taken to Novi Sad city where they are killed by ‘euthanasia’, using Pravilnik 29/94 legislation. Prior to the new Serbian Veterinary Law of 02/10/2005, there was an old law dating from 1991 for the health protection of animals. In agreement with the old law of 1991, the authorities produced their own other ‘underlaw’ (extra law) regulation – named ‘Pravilnik 29/94’, which was intorduced to allow the killing of animals after they were held in pounds for 3 to 7 days. ** From 02/10/2005, the new Veterinary Law Article 168 effectively destroyed everything that was written in Pravilnik 29/94, ** because the 2005 law demanded the care of animals. Pravilnik 29/94 was overwritten by Article 168, the result being that all killing of animals was forbidden apart only from cases for Rabies infected areas, which were covered by application of Articles 64 and 65 of the Veterinary Law. By continuing to undertake the killing of animals after 3 to 7 days in accordance with regulation Pravilnik 29/94, the authorities were then in a situation where they were working in opposition to the actual existing law. But it is very much the case, even up to the present day, where authorities are still using Pravilnik 29/94 as a reason for the killing of animals. But in reality, Pravilnik 29/94 became nonexistent on 02/10/2005 with the introduction of the new Veterinary Law (Article 168). Hence there should be no killing, but animal care instead. Pravilnik 29/94 is only an ‘underlaw’ (extra law) regulation, has very less power than the actual law, and most importantly, must be in agreement with the existing law. Pravilnik 29/94 was valid originally (1991 on) to protect animal health but is now in opposition to the new and current animal law – the new Veterinary Law Article 168 of 02/10/2005. Serbian campaigners have written to the Constitutional Court saying that it is unlawful for Shinters (Dogcatchers) and also veterinarians to kill stray dogs and cats only after they have been held for three (3) days, as this is now old and outdated legislation. Killing is forbidden under the new Veterinary law. Campaigners have now heard from the court in writing, and they say that no analysis of the case is necessary for Pravilnik 29/94 as it has been replaced by the new Veterinary Law Article 168 (02/10/2005). This is exactly what the campaigners had said, ie. that the old ‘underlaw’ (extra law) of Pravilnik 29/94 was still being used when it fact it has been overwritten by the new Veterinary Law Article 168 of 02/10/2005. In addition, Article 46 of the new Veterinary Law (02/10/2005) states that the killing of stray cats and dogs is forbidden and that instead they should be provided with care. The word from the Serbian Constitutional (law) Court is that from 2005, animals should be provided with care and not be killed. It would appear that all of the public firms responsible for garbage collection in Serbian cities are still working to, and effectively using Pravilnik 29/94 rather than Article 46 (168) of the new Veterinary Law. In effect, by still working to this now non existent law, these public firms who collect and kill strays are UNDERTAKING ILLEGAL WORK– they should be working in accordace with the new Veterinary Law Article 46 (168) of 02/10/2005 which demands care for the animals. Unlike the Temerin ‘shelter’ dogs which are illegally killed after only 3 days, Cats which are taken to the ‘shelter’ do not even live three days – they are killed immediately. Serbian campaigners have now taken this case to the court of human rights in Strasbourg – an EU court. The case – Garbage collectors in Serbian cities are still working using the (now) non existent Pravilnik 29/94 rather than Article 46 (168) of the new and current Veterinary Law of 02/10/2005 which demands care. In addition, campaigners have requested justification be presented for all the animal killings by the authorities from 02/10/2005 right up to the present day. Mr. Radivoje Kaurin – Chief of Hunting – Forests Inspection. 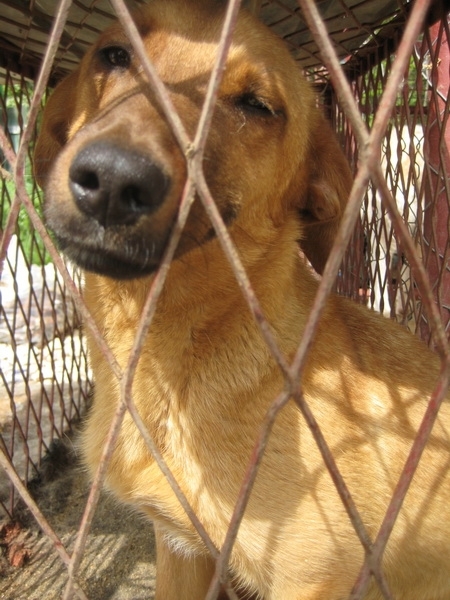 So the situation is that many Serbian authorities are not implementing the most recent and current legislation which would give protection to animals in shelters, but are instead using old and outdated, non existing legislation (Pravilnik 29/94) as justification for the continued killing of animals held in shelters. Another very important factor here is that what has been happening since 02/10/2005 is that existing Serbian law (legislation) has not been implemented throughout the country in relation to animal welfare. And the proof of the implementation of the ‘Rule of Law’ is a paramount requirement for any nation wishing to become a future member of the EU ! And so what about the ‘Shelter’ for animals at Temerin ? We declare that the alleged ‘shelter’ at Temerin is NOT shelter but a terrible, unlawful place being funded by Serbian taxpayers to the tune of many millions of Dinars. Is this facility simply a place that takes in public money allegedly caring for animals, whilst at the same time killing them immediately (cats) or after just three days (dogs) using outdated legislation which was replaced in 2005 ? – we think so. Animals such as these dogs and cats which are taken from the streets by shinter teams, are not marked or identified in any way. There is no way that the authorities can provide details of the animals taken by the shinters, be it 10 dogs or 100 dogs captured. In effect, with no accountability of their work, these public firms can ask for as much public money as they wish – and very often / always they are provided with it !! Can this be called ‘organised crime’ ? If a full sterilisation, vaccination, identification and care system was established for all stray animals taken by the shinters, then the facilities such as the Temerin ‘shelter’ would be very much more accountable (ie. Record keeping) of all animals which enter the facility. As it is, by using old, outdated, self created (mass killing) legislation such as Pravilnik 29/94 rather than working to what should be current animal protection legislation, (ie. Article 46 (168) of the new and current Veterinary Law of 02/10/2005), the authorities and those involved with it appear to in a situation where they can request, and are provided with an endless supply of public money – public money for killing animals – WHICH IS ILLEGAL (since 2005). The man wearing the black hat in the picture below is Tamas Paska. 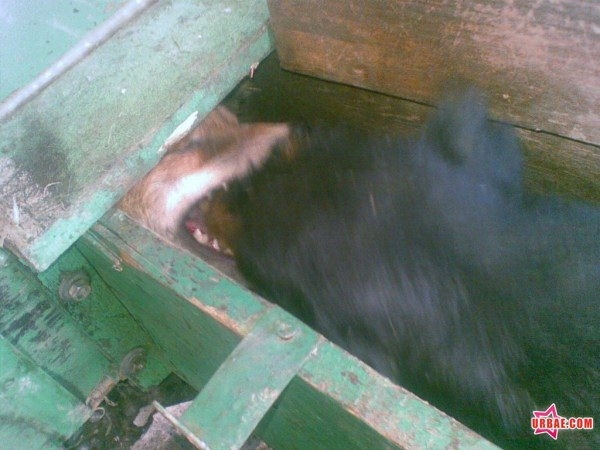 Serbian animal campaigners have made several criminal charges against him in the past. 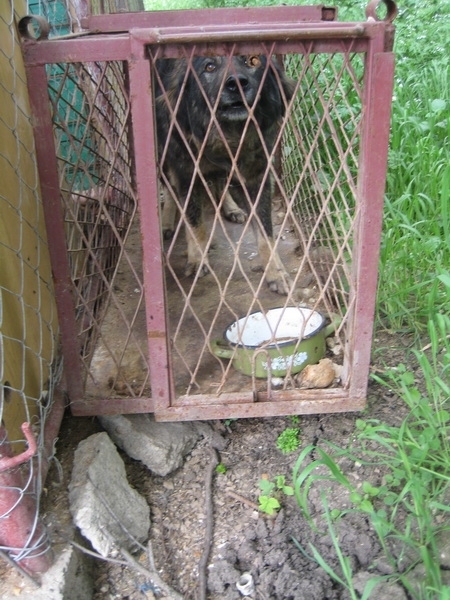 By chance, Paska also lives in Temerin City (detailed above). 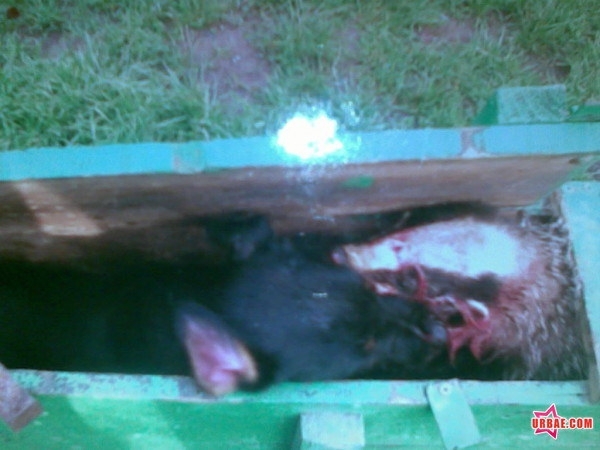 The photographs which you can see (above and below) in this post have been presented by Serbian campaigners to both the police and to the Public Attorney of Novi Sad, the city near to Paska’s city of Temerin. We have been provided with names of persons engaged in similar organised animal fights on the city of Subotica. 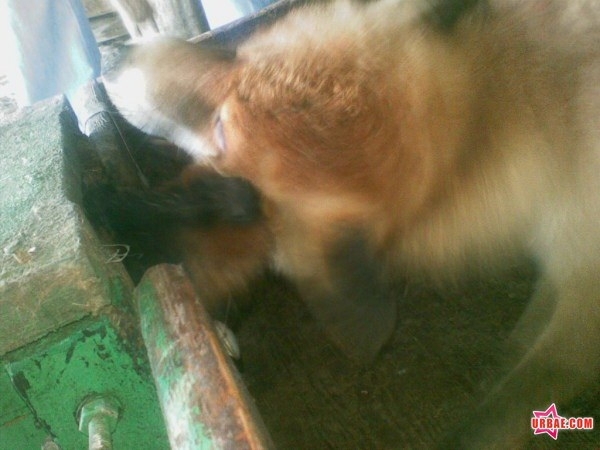 Animal fights which are undertaken at individuals homes. In response to the evidence, some of which is shown here, as well as names of individuals involved and the cities in which these crimes are undertaken, the Serbian public Attorney has written to welfare activists and stated that ‘there are no elements of any crime or any criminal act’. Because of this, and the fact that they know they are safe under the statements issued by the Serbian Public Attorney, Paska and the others continue to undertake their ‘non criminal’ acts, as you can see in the photographs. With Public Attorney officials and police such as this, one has to ask who actually controls and heads all of this animal fighting crime ? – but then it is not a crime; campaigners presenting the evidence have been told all of this ! Implementation of the ‘Rule of Law’ is a paramount requirement for any nation wishing to become a future member of the EU ! …. And that should include Serbia; but does it ? – a point that we would argue given this evidence and the declarations made by the Serbian ‘legislators’ – the Public Attorney. This data , including photographs, information and the responses of the Serbian Public Attorney, as well as the information relating to the situation at the Temerin City ‘shelter’ will now be presented to the officials of the EU. Lets hope and trust that they take more action to fight crime than the Serbian officials and police!